Choose Mobile LCD Stands From Many Models In Stock Online! 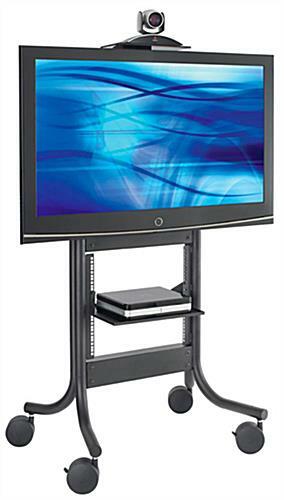 Perfect multimedia cart for schools, conferences and meetings moves and stores equipment securely. Durable black powder-coated finish protects steel stand from scratches or damage. VESA compatible mounts holds 37-70" TVs up to 300lbs. These mobile LCD monitor stands have a sleek modern design and black finish but are made from durable steel. These rolling AV equipment carts have four heavy duty casters for ease of movement. These portable trolleys, steel powder-coated mobile LCD monitor stands feature (2) locking wheels that keep the stand in place when in use. These user-friendly mounts are VESA-compatible and can easily hold a 37-70" flat panel TV that weighs up to 300 lbs. 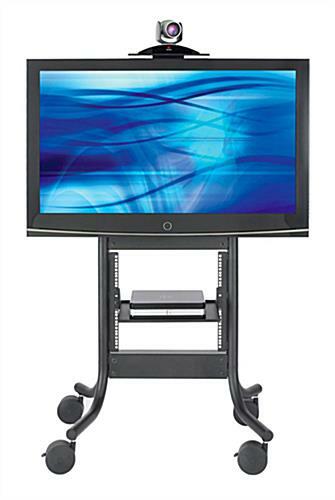 These black video-conference and presentation carts, mobile LCD monitor stands will hold many different media devices including audio equipment, webcams, modems, codecs and DVD/CD players. These media trolleys feature an adjustable camera/codec shelf, 6-plug surge protector, 10RU rack and a cable-manager tray. These mobile LCD monitor stands, also known as presentation trolleys for flat panel plasma screens, are great for use as showcases for videoconferences or multi presentations in schools, businesses, commercial establishments, at conferences and tradeshows and more. These stands are an economical and attractive alternative to hauling valuable technology devices from place to place for presentations because they are easy to move and have integrated storage. 35.0" x 60.5" x 26.5"